Translation by Francois Mavel of the review in the April 2003 issue of Micro Simulateur magazine. Welcome to the MAAM-Sim Club! After the gorgeous FS2000’s R4D-6, The MAAM-Sim team set new standards with the B-25J Mitchell, an example in the world of modeling. Article: MAAM, which stands for Mid Atlantic Air Museum, is an American museum where a good collection of old airplanes are restored. And this activity, as everyone knows, is expensive. Thus, MAAM-Sim, previously known as the R4D Team, a branch created by simulation fans among the museum, is in is own way collecting money in order to restore and maintain these historic old birds. The team is composed of Bill Rambow, Jan Visser, Fred Banting and Robert Young, that is to say hotshots in the Flight Simulator modeling business. The North American B-25 Mitchell is principally known for the famous Doolittle raid. This mission, set on April 18, 1942, was aimed on showing the Japanese that their homeland was not sheltered from allied bombing. Lightened as much as possible, and thanks to their two Wright Cyclone R-2600-29 1700 hp engines, sixteen B-25B’s succeeded in the exploit of taking off from the American USS Hornet aircraft carrier and blasting Japan, and its capital city Tokyo, which was thought as untouchable. 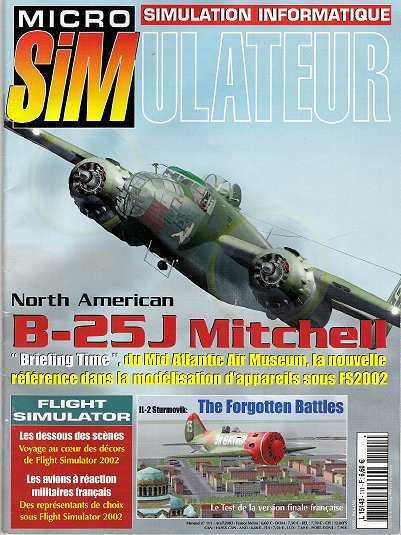 The virtual B-25J is available in two versions, one demo-freeware and the other payware. The freeware one is lightened from several views replaced by insets showing what the full version is all about, but let you get a general feel for the product before buying it. (editor’s note: the demo version is no longer available) The second one, payware of course, is available in two, more complete distributions, one downloadable on the net, and another one, more interesting, on two cd-roms. This is the one we have tested. The first cd includes the program which auto installs the airplane and some situations. You can find also a very thorough HTML manual and a series of video clips presenting the aircraft and explaining (in English) the different checklists. The second compact disc contains 500 pictures of the airplane, 4 scanned original flight manuals and 48 minutes of videos. The simulation starts with the 2D cockpit. You will see a high degree of accuracy in the global definition of the instruments. Their position and size seems to be calculated in order to get the maximum on the screen without sacrificing the readability in all possible screen settings. The two pilot panels are called htrough the Shift + 2 and shift + 4 keys, as well as two more so-called IFR enlarged panels. Every panel is fitted with a button bar used for switching from one panel to another, showing the electrical panel, enlarging the throttle quadrant or calling the ATC window. The use of the rear quarter views let us discover the two waist machine guns located at the back, the bombardier position located below the pilot at the front, and the ones of the upper turret. The tail gunner position is the only one missing. Of photographic quality, all these views thrill by their graphic sharpness and above all their mill metric setting. One may think that such visual expense would hit the frame rate, but this is not the case. Moreover, the virtual cockpit fully textured view is unbelievable. This is it! Every visible face and the smallest piece is totally textured, and the group of added equipment (seats, box, radio set, tins, documents, headset, etc) is Grand Art. You find yourself looking around every corner of the aircraft, internal and external. The walk around confirms the first impression with a bagful of details: the different landing gear drawing, the shape of the props, the antennas, the sculpted tires, the cables, the aileron hinges and the representation of the engine cylinders. But what is striking is this texture layered on the airplane which lets you detect every dent, every bump, on the so many time repainted metal skin, as a testimony of the old age of the B-25J. You are nearing perfection. This aircraft, for sure, sets the standard. It is high time for a touch & go to test this airplane. The mesmerizing, digitalized sound of the reciprocating engine is just too tempting. We quickly go through the checklists just for revving up the engines and taxiing toward the runway. The dynamic shock absorbers of the tricycle gear start working in sync with the rolling wheels, and the flight controls – animated in the virtual cockpit - smoothly respond. Holding position onto the runway axis, we throttle up to the full detent and the two engines of the Boeing (sic) are rattling, swiftly swallowing the runway to take off majestically, slightly flat, as in real life. The pilot calls out every flap or gear operation. We understand that the extension or the retraction of the flaps is done by pushing or pulling the handle, then releasing it when in position. The aircraft is then climbing very quickly and needs to be trimmed. The different maneuvers are performed and, during cruise, we open the bomb bay door and watch the six bombs rack. Next, the approach where the airplane is found very stable at low speed, just a little bit heavy on the roll axis. Corrections are easily done and the landing is performed almost flatly, without any fuss. The flight model is without any doubt excellent. We open the exit ladder below the aircraft to egress the cockpit and give a salute to the pilot who bothers to open his window and wave back. On our testing computer, the B-25J revealed not to be resource hungry, as we obtained 22 fps instead of 28 fps with the original Cessna. Nevertheless, the programmers thought of lower end computer owners as they offer three versions: Full, Medium and Light. Differences are not in degrading sounds or textures. They work on diminishing the number of visible pieces in the peripheral views and by substituting, in the Light version, the virtual cockpit behind the seats by a picture. The second CD-rom contains six videos displaying the B-25J under every aspect during several air shows. But the cream of the crop is the scan of five vintage flight manuals, valuable as nothing else. This product is a must have, and the price tag is quite reasonable! Downloadable aircraft: $ 25. Multimedia cd-rom: $ 10. Full cd-rom pack + shipping outside the USA: $ 39,95. Bottom: Window opening sequence using Shift + W key. Left: Not less than five totally vintage flight manuals has been fully scanned and are present on the second multimedia cd-rom. Right: Virtual cockpit panel. Flight controls are animated."